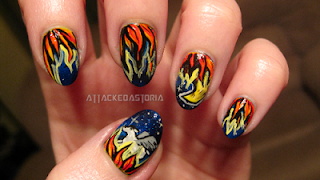 Attackedastoria Nails: Fall Out Boy nails.. light 'em up! 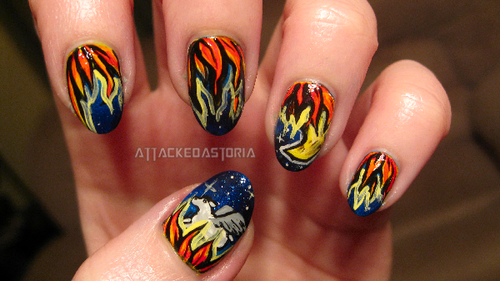 Fall Out Boy nails.. light 'em up! So.. most of you probably aren't aware, but I am HUGE Fall Out Boy fan. Huge. Ever since 2003. I love them to death, and just today, they came off a 3 year hiatus to announce a new album/tour. I AM SO HAPPY. I cried a little, I'll admit it. People don't understand how much this band means to me. These are based on the new video for the single remix, where all their old merch and albums are being burned.. I loved it. Great symbolism. I'm really happy with the way these turned out.. and I hope to God I can get tickets for their tour. I love me some FOB, happy dances were done when I found out they were putting out a new album and touring. 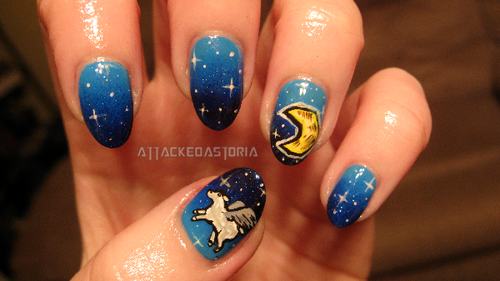 Love the nails! Great design! Happy FOB are back, so many memories tied to that band. Simple skull accents, plus my v-day mani.